barton originals: I Love Craigslist! I have been looking for awhile for a leather set like the above. I've found several, however neither my hubby or I really wanted to pay close to $5,000 for a set. I'm also of the firm belief that when possible, buy used rather than new. The other night I came across an ad on Craigslist (since been taken down, but I grabbed the pics) for the above set at a ridiculously low price. Answered it, went to see the pieces last night, bought it. It is super comfortable and much larger than it appears in the pics. The slight bit of wear that it does have gives a warm, rich patina to the leather. The colour is a deep burgundy, brown. We will be getting it on Thursday evening so I'm in the process of rearranging and moving our current livingroom furniture out. The next step will be repainting the walls, hanging some fabulous vintage barkcloth drapes that I have been storing for years and getting a new area rug. What a lift a purchase like this can give one! Awesome find Sue! I too love me some Craig's List! I could do a whole tour through my house of things we've bought on there. Between that and the auction house we go to, we save a fortune! What a terrific bargain! 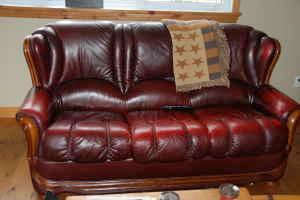 I agree - "used" leather is much more attractive than new. Those look especially comfortable. I've never bought anything on Craig's List ... in fact, LOL, I think I've only been there once! Wow! Lucky you! This is a terrific find. 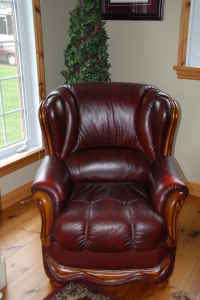 I agree with Tristan - the softness of the "used" leather gives these pieces such a nice warm and cozy look. Nice score, Sue! They are beautiful! I will have to go visit Craigs List myself. xo! Yeah Sue! Those are gorgeous! You totally scored! WOW! Good for you, that is a great find! I am so jealous you have no idea! Great pieces my dear. These are great Sue! They look inviting. Never used Craig's List...maybe I should. I agree with buying used in good shape...let someone else break them in. You really found a keeper! Enjoy all the fun of something new to you.. I just love a bargin, and your suite looks as if you got a good one. It looks in wonderful condition, and a great colour. Pre-loved stuff is all the rage here, recycling with a better name. Last week end we went to a Braderie (our European connections) - a French name for a garage sale, I got a 'new-ish' light weight step ladder, shears, dutch hoe and a rake all for £10/$15... fantastic. The step ladder alone would have cost me £40/$60's. What is a Craig list? by the way..
Wow! You really did find a bargain! 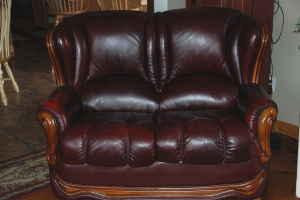 ....and to find leather that already has that great look to it because of use! Will have to check out "Craig's lins.." ...We find great bargains at the "Habitat for Humanity Restore" but nothing as nice as this! Great score! Looks like you were meant to have these!!! Have you seen Craiglook yet? I think you'll LOVE it. ; ) I did a post about it on my blog a while back "happy online tools" or just go to the site. It's pretty self-explanatory. WOW great find! love them! I love craigs list too! I like the woren look! You really did score! Love it and glad I found your blog. Your work is BEAUTIFUL!